In MoodyTalks #2 – James Moody shares his golden nugget inspired by the story of the prophet Elijah and the false prophets found in 1 Kings 18-19. God has given you the capacity to do great things for him but he also hasn’t forgotten who you are. God understands what you need and what you’re capable of doing; after all he created you! Don’t be afraid to enter in God’s presence and entrust every aspect of your life over to Him and witness the amazing things he can do in and through your life. King Saul pondering next action in distress while future king, David plays the harp for soothing. I finished reading 1 Samuel in depth and King Saul’s life is a very fascinating and ultimately an upsetting one, in regards to the ending. King Saul was the first appointed King for a united Israel as it had previously been divided in tribes. A King was demanded by the people of Israel, even though the prophet Samuel warned them to wait for a King first. Due to the immense demand by the people, God anointed Saul to be King. He had all the attributes that everyone could aspire to, he was the people’s King. Saul was tall, handsome, strong, rich and powerful. As King Saul’s life was chronicled, we witness key defining aspects that attributed to the fall of King Saul. King Saul was anointed by God to become a King. All one needs is an anointing to know that they are in the right place. That anointing was appointed by God. King Saul knew that. However, he failed to continue building his foundation in God. “Saul tried to please God by spurts of religiosity but real spirituality takes a lifetime of consistent obedience. Heroic spiritual lives are built on top of the other. Like a brick, each obedient act is small in itself, but in time the acts will pile up, and a huge wall of strong character will be built – a great defense against temptation. We should strive for consistent obedience each day” (Life Application Study Bible). Saul seemed to treat God as a go-to-genie when things are not going his way or he is in trouble. This caused Saul to neglect building a relationship with God and genuinely allow God to lead the way. Samuel is a perfect example of someone who had a foundation in God and allowed God to lead the way. When God called Samuel, he said “Speak, LORD, for your servant is listening” (1 Samuel 3:9), whereas Saul replied to God (who was speaking through Samuel) “Why do you say such a thing to me” (9:21). There was a lack of foundational trust in God. Saul was more dedicated to himself. 1. What is our foundation? Speaking of being dedicated to himself, It was mentioned that Saul was tall, strong, handsome, rich and powerful, but all this wasn’t enough. On the exterior, he looked the goods; but the interior showed otherwise. Saul was big physically, but small in God’s eyes. He was handsome, but his sin showed his ugliness. He was strong, but lack of faith made him weak. He was rich, but spiritually poor. He looked good on the outside, but inside he was decaying. 2. How is our interior being? King Saul became jealous of David because David was winning the respect and admiration of his people, This spurred King Saul to react, attempting to pursue and kill David. Saul was ravaged by bitterness, jealousy and rage because he was charged by emotion, anxiety and distress. In all these moments, King Saul failed to truly reflect, repent and respond. Everything he did was a reaction to circumstances that sent King Saul further tumbling down. 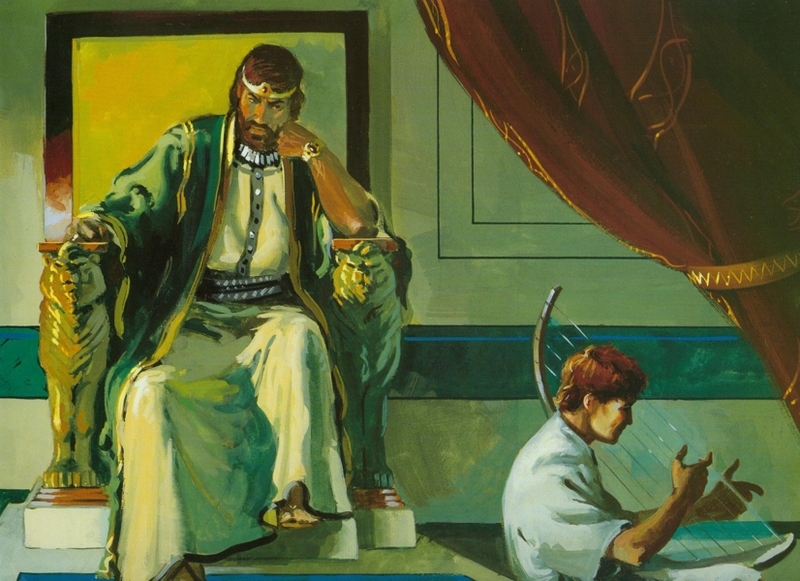 The most heartbreaking moment for me in the story of King Saul, was King Saul, in his last moments of despair, killed himself by dropping onto his own sword. In the same day, he lost all his sons, his armor-bearer and ultimately, his own life. That should never be the ending of a man who was anointed by God. “Saul faced death the same way he faced life. He took matters into his own hands without thinking of God or asking for His guidance. If our lives aren’t the way we would like them to be now, we can’t assume that change will come more easily later. When nearing death, we will respond to God the same way we have been responding all along” (Life Application Study Bible). When facing situations, we need to reflect and think about what is happening? how am I feeling? and we need to repent if we have wronged God. Repent means to make a 180 degree turn; in other words, turn to God and surrender it all to him. After all this, we can respond with the wisdom and peace of God, no matter what distress we are facing. 3. Are we reacting or responding? As you read through the chronicles of King Saul’s life in depth, it brings many practical insights and lessons that we can learn, especially lessons for the soul. These three questions are ones that I want to highlight from this story and you to reflect on. Let’s allow God to spearhead our lives, especially when we receive the anointing to do what God has appointed us to do. With God, we can do all things, it is up to us how we respond and how we build the foundation and ourselves. Doing the right thing effectively positions us for God to do great things within us and through us! I was doing my daily reading last night and I have been digging into Exodus. I got to the Tabernacle aspects of Exodus which I got bored of two years ago and halted my Bible reading because of that. Knowing this, I began to read with intent; yet, I still got bored once again. Why did I need to read slabs of instructions about something that I will never build or see. Heck, I don’t even read many instructions when it comes to buying video games and such. I wanted to find some sort of application from these Scriptures. All of a sudden, as I shifted my focus back onto Exodus, God brought illumination instantly! It was incredible really, because I knew it was a ‘live communication’ with God. What can we learn from the events of the creation of Tabernacle and its contents? It was awesome to see how God called people up, with the skills he provided to them through the Spirit, to take part in the development of the Tabernacle. He called up carpenters, scribes, craftsmen, Priests and so on. God knows the people you need to help you build the Vision that God has given you and others. Lastly, this thought came at the end. As I read through slabs of instructions, all the contingencies, and the need for it to be perfect and pure. I just stood back and said, ‘THANK GOD FOR YOUR GRACE’. If it wasn’t for God’s grace, then we would be having to follow all these laws, instructions and such with a small margin of error, to be pure and righteous in front of God. Thankfully, we have a grace that purifies us, that allows us to have a beautiful and intimate relationship with God! Now I am glad that God opened my eyes and was able to give me something that was relevant to apply into my life when I read Exodus – The Bible is truly a living and breathing Word of God.